An essential item in every woman’s wardrobe, I love a pair of plain, simple, sophisticated suede pumps. In a neutral colour, an elegant pair of pumps can wear with just about anything (particularly well with slim leg crop pants or a sheath dress). And to find the right pair? While I’m a fan of real suede, there are several synthetics out there for less than half the price (and with synthetics you don’t need to worry so much about care, wear, and tear). 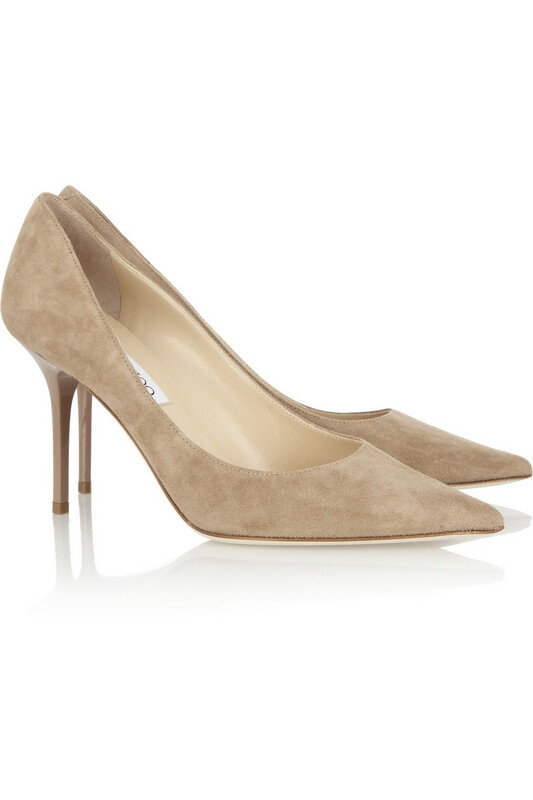 Jimmy Choo Agnes Suede Pumps, $575, Net-A-Porter: Jimmy Choo’s ‘Agnes’ pumps are the perfect pointed toe pumps. With a heel that measures a modest 3.5 inches tall, these shoes are safe for both the office and after-hours. 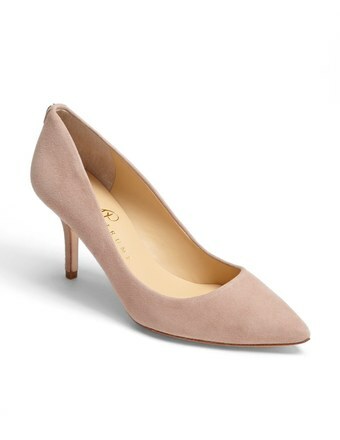 Ivanka Trump Natalie Pumps, $130, Amazon: I’ve recently become an Ivanka convert. Most of her designs are classic, and to purchase a pair of Ivanka Trump shoes, you don’t have to break the bank. Case in point? Her ‘Natalie’ pumps. They fit true to size, they’re well-made, and comfortable. The heel measures 2.75 inches, which again, is fair game for the office and after-hours. Synthetic Ulundi Pumps, $60 $29.98, Aldo Shoes: These pumps are not real suede, but the beauty of synthetic materials is that you don’t have to be concerned with proper suede care. These pointed toe pumps are low (or no) maintenance, feature a straight, 3-inch heel, and a pleated detail on the front of each shoe. Sometimes, when it’s really cold outside, when the wind is blowing, and the snow is flying, I like to sit back and peruse the Spring collections, and look at the latest and greatest from my favourite online boutiques. There’s nothing like a little colour to chase away any inkling of seasonal affective disorder. That’s only one of the reasons I’m loving the updated classic leather ballet flats by J.Crew. Available in ten of the most vibrant hues, J.Crew’s classic leather ballet flats have been updated with extra padding on the insole (hello cushioning, thank you!) and a removed shank (that’s the narrow middle in the sole of the shoe). The result? More flexibility and more comfort. The leather is the softest ever (I can testify to this), the colour choices are fabulous, and the shoe is a classic. Available in sizes 5 through 12, there’s a J.Crew ballet flat that’s meant for your foot. PS. The $146 price tag? Worth every penny. These are lifetime shoes made in Italy. Browsing the Net-A-Porter seasonal sale for alternative winter footwear, as it turns out Australia Luxe and Ugg boots aren’t made for slushing it back and forth to work everyday in the Canadian winter. If there’s any necessity when packing for a family weekend away at the cottage, it’s a solid pair of rain boots. Especially during these fall months when weather is unpredictable, there’s nothing like strutting your stuff around cottage property with confidence (and believe me, I learned the hard way you can’t do this wearing Italian leather boots). Taking a cue from the Queen of England, I highly recommend Hunter Original Wellington boots for your outdoor adventuring. Available in a variety of colours, heights, and with so many fantastic details, Hunter rain boots are far from your average rubber boots. They’re easy to care for and clean, and so much more practical than even the most comfy pair of Uggs. Whilst there’s something so classic about the Originals in green, I’m also fond of Hunter’s Festival boots and also the Original Short Wellington with laces. A hint for cold weather? Buy the sock inserts and you’re sure to keep your feet toasty warm. Tunisian designer Azzedine Alaïa’s been perfecting his craft since the 1970s, along the way making stops at Christian Dior and Thierry Mugler. Original screen icons such as Greta Garbo helped him make his mark as a reputable designer. It’s no wonder that classic starlets and socialites flocked to style Alaïa’s designs. Even today, the artist has the likes of Victoria Beckham and first lady Michelle Obama coveting his craftiness. Look at these lace-up suede ankle boots. The combination of intricate details like a ruffled trim and zip-up back make these shoes a work of art. French sophistication at its finest, these 5-inch heels have an almond-shaped toe and open tie front. Alaïa’s feminine, Parisian suede bootie would wear well with an embellished sweater-dress or wool skirt and blouse. Never have I been a huge fan of wedges; I’ve always thought the geometrical shape of the heel stood only to shorten the look of gorgeous gams. Leave it up to J.Crew to change my mind. How much am I loving these J.Crew Dorian wedge sandals?! The mid-height 3-inch heel makes these wedges a supportive and stylish choice for work and play. Designed in an über-soft suede, and available in black, burnt sienna, and shadow (my personal favourite is black). These made in Italy shoes are the perfect footwear for the end of summer. They’ll segue well into fall, and when the September breezes start blowing, you can pair J.Crew’s Dorian wedges with tights. Some people find themselves attracted to things that are shiny. I would be one of those people. Couple that with my affinity for old-Hollywood glamour, and you’ll understand just why I love mirrored leather shoes. You can dress them up or dress them down – whatever way you wear them, you’re guaranteed to turn heads. Check Christian Louboutin’s ‘Fred’ leather lace-ups. On the train with this summer’s brogue shoe trend, these flats are both daring and dramatic. I love how the editors at Net-A-Porter combined them with a casual look for even more pop. The go-to girl for flats, Tory Burch makes a chic – and comfortable, too! – mirrored leather ballet flat with her ‘Reva’ style. While I’m not one for elasticized heels, these shoes don’t pull or press, so don’t be worried about blisters. Topped with her signature medallion in matching fuchsia, these eye-catching flats are so elegant. Designed in classic silver, these super strappy stunners by Giuseppe Zanotti would set off any LBD or LWD this summer. Besides the mirrored leather, I love the pyramid stud detailing on the back of the heel. At 4.5-inches high, these heels are killer! Love it when I find a pair of boots – on sale, no less! – that can style sweet with everything from skinny jeans to spring floral dresses. These J.Crew suede ankle boots are completely chic, and a worthy wear for spring. Definitely vintage-inspired, J.Crew’s Sahara boots feature lace-up fronts, an almond-shaped toe, and a 3-inch stacked heel. The desert brown suede is versatile – wear it with virtually every colour in your wardrobe. And, these boots are apparently all-day comfortable. They’re made in Italy, so I’m tempted to believe, but the proof is in the pudding, so we shall see…! He’s certainly not Irish, but Christian Louboutin sure knows how to make things festive! Love Louboutin’s Talitha sandal – all seventies-inspired with it’s exaggerated platform, strappy leather peep toe, and lime green colouring. Not sure if any of you ladies – or men – style green for this once-a-year Irish celebration, but I’d definitely be styling these if I did! Check Aigle’s short-shaft rubber boots. French for “eagle”, Aigle boots come from a brand created more than 150 years ago in France. All-natural rubber dyed a nifty shade of nickel and lined in cotton, these are the perfect puddle boots to style now until Spring.